This topic contains 16 replies, has 6 voices, and was last updated by Vanellus 6 months, 3 weeks ago. This seems like a great resource for improvement and feedback, thanks to Hamish for setting it up. To help get the ball rolling I thought I would submit a puzzle, feedback would be very welcome and I hope it provides some enjoyment. This was set before investing in Crossword Compiler. As such the grid was compiled with heavy use of onelook.com, which I can say is very useful if you don’t have access to software. I think I used a Guardian grid as a starting point although can’t remember for sure! This is also the first time I’ve tried doing something out of the ordinary in the grid (I will say no more). I’m afraid I don’t have a solution to hand in an uploadable format but I can provide it in text form if needed! I used to set for my University paper over a decade ago, which was great fun even if the clues are a bit sloppy in retrospect! Decided to pick it back up and set a few puzzles in 2016, getting feedback from friends. I attended Boatman’s masterclass last spring, which I can heartily recommend, but otherwise I didn’t make much time for setting in 2017. One of my new year’s resolutions is to set a puzzle every month, and in doing so get better at using Crossword Compiler. After I’ve got a few more under my belt I may submit another to see if I’m progressing. I confess I’ve been meaning to subscribe to 1 Across for a while but haven’t got around to it! Will rectify that ASAP, it seems only fair in return for this useful resource. I look forward to trying the puzzles already posted when I have access to a printer, and will do my best to give constructive comments on any other submissions. Good to see you, Joe – thanks for the puzzle! as a show of solidarity with other new setters on this site, I had a go at your crosssword this afternoon. Generally, I found it very enjoyable, with good surfaces and a nice range of clues. Clues that I thought worked really well were 9,12,19 across and 2,3,4,10,15 down. Probably, 12a was my favourite. 2) I also felt that the answers to 5 and 22d were somewhat obscure. I think that if you use an obscure word, an anagram is not really fair. I had all the cross-checking letters in, but was left with a load of vowels which could have gone in in almost any order. Similarly I thought remainder in 23d was a fairly vague indicator for another obscure word. And while the Roman numerals gave you 3 of the letters, I think “1” for “a” is a little unfair in this context. Thanks Italicus! Appreciate the kind words and the suggestions. 1) Good point, I hadn’t clocked so many proper noun uses. I could easily have changed the solution to 24A, enabling a more interesting clue. Or perhaps done something with UCAS to tie in with the university angle, if UCAS forms are still a thing. 2) Solutions for 22D and 23D were a bit forced so I could achieve the grid-fill constraint (which you may have spotted?). But yes, good reminder that harder words go better with easier clues. I can see how a charade or container might have made 5D a bit fairer, and maybe a less cryptic defn. You certainly set yourself a challenge with the pangram! Well done on achieving it. I didn’t think 5 down was too obscure or unfair and I thoroughly enjoyed the misdirection. I liked the link between surface and answer in 14/23, even if @feller@ felt a bit forced. 22 down was a new word for me – I could see what it had to be from the crossers and clue but needed Chambers to persuade me that it was a thing. A reference to “the creator of Hawking’s chair” for 24 across, perhaps? My only gripe is that I can’t parse 15 down – but that is probably just down to me. Excuse the redundant @s around feller. Getting to grips with a new keyboard, I’m afraid. I’ve downloaded your puzzle and really like the grid you’ve used and the surface readings of the clues are great, but I’m loath to start trying to solve until I know I can get the answers, preferably with brief explanations, if and when I get stuck. 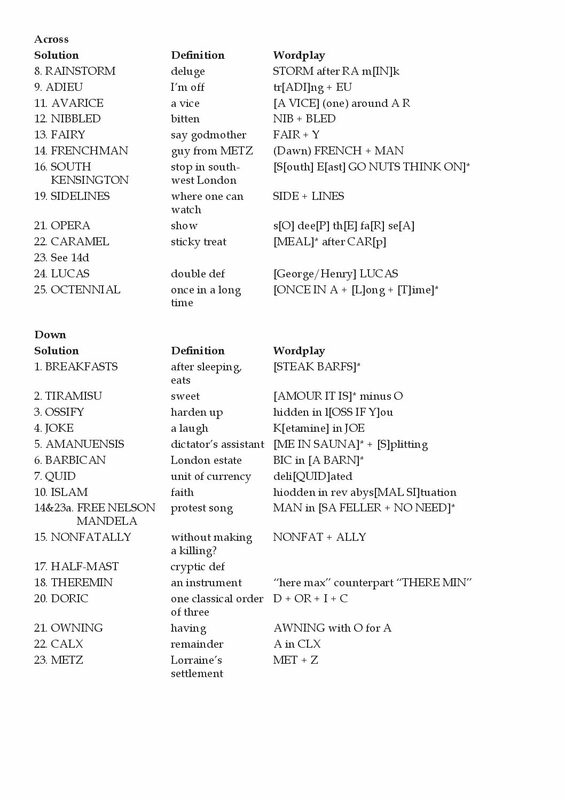 Hi Whynot – not too much trouble to put solutions into a PDF, so here you are! Hope you enjoy. I’ve still got your Beirut puzzle printed off for when I get some solving time, looks tough but very intriguing. Jack – thank you for the feedback! I like the suggestion for 24 across. Thanks, Nutkin. I’ll definitely try it. Sorry not to get back to you earlier; for some reason I didn’t get notified of your post. In Beirut is not too difficult. It’s easy to get started in the fully-checked corners, then burn your way in to the centre, and if it doesn’t make you laugh, I guarantee it will at least make you groan. 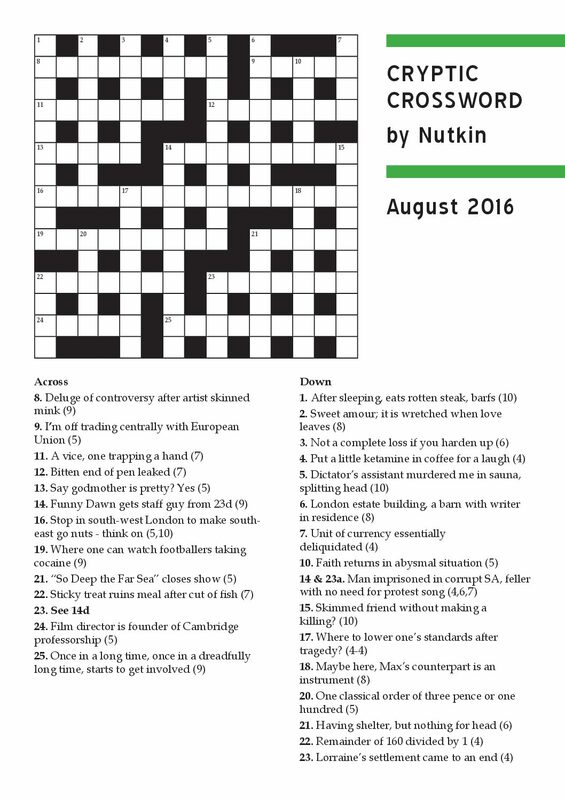 Very enjoyable puzzle, Nutkin, with smooth surfaces and generally tight cluing with a good variety of types. I agree 24 was not a good idea, and in fact I never got it, and think probably I wouldn’t have, even if I hadn’t entered CHAR for 22d (I actually thought CALX first, but didn’t find it in Chambers — even though it’s there! Never heard of the Lucas professorship). “Film director” is a bit wide, too, although of course I’ve heard of Lucas. Hope that’s not just sour grapes. 11 was FOI, an interesting technique in the clue but I saw the answer quickly. 14a, wasn’t sure if staff implies more than one, but guy made it clear it was singular. I suppose you can have a staff of one? It was good to have the extra help for 23d, since “funny Dawn” was easy for me. Maybe “Dawn of humour …” could have been a more cryptic way to start? 19. I’m almost sure I’ve seen this before, held up as an example of a (good) clue in some context, maybe in Pretty Girl In Crimson Rose? It’s an excellent clue. Well done if, as I assume, you came up with it independently. 1d Very vivid surface. Nice anagram, which seemed obvious. Once I got it. 4. Didn’t know that word for coffee, but worked it out from the clue and confirmed it with this interesting page about it. 5. Pace Italicus, I thought this was a good clue, and liked the misleading definition, but then I was familiar with the word. 14, 23 Nice reference in the surface, but that did give it away (I’m happy to say). I worked backwards to the anagram. 18. Lovely device. I knew of the instrument but thought it had an A in it. Can’t find it in my Chambers at all and had to google to confirm. Of course the right spelling is clear from the wordplay. 23. Thought I was going to have to look on a map, but when I got the T, it came to me. A fair clue, I thought. Nice work. Lots of fun. Keep ’em coming! Thanks for the kind words, glad you enjoyed! To mildly defend myself on 14a, “staff” is to be regarded as a verb, which leads to the relevant part of the solution more directly. But as the noun sense is so close, it could be misleading (in the less fun way). I did read and love Pretty Girl in Crimson Rose, albeit a long time ago, so there’s a chance I’ve subconsciously lifted that one! Enjoyed the origin story of “joe” as well, with it being my name I’m surprised I’d never thought to look it up. Other suggestions helpful and noted, especially 16a. Obvious only in retrospect! This reply was modified 1 year, 2 months ago by joeplus. Ah, yes. Nothing at all wrong with staff, in fact; just me falling prey to your deception. I really should have found the “footballers” clue before raising the spectre of (even unintentional) plagiarism. I’ve started to wonder if I just remembered it from the initial read-through a couple of days before solving. After learning a new word for coffee, I did wonder if “Joeplus” was something you took when setting/solving, especially having recently read of Stephen Fry’s admission that he used to do a line of Charlie before attackibg the Times crossword. Haha! No “joeplus” involved, I tried that once and didn’t like it at all. There might be a themed puzzle in there around recreational substances with friendly names: we’ve covered Joe and Charlie, you could add Mary Jane and probably lots of boozes – Captain Morgan springs to mind. Not forgetting Billy and Henry. There’s at least one clue you’re pretty much guaranteed to like! Please don’t post comments on it here, but perhaps Hamish will be kind enough to give you my email address, taking this as authority so to do, if you wanted to give me feedback.